Ahead of my trip to Devon I've been gathering stuff together - outfits, toiletries etc. I'm getting really excited to leave now! The stress of real life after university has been getting to me so a weekend break with my lovely boyfriend is just what I need right now. It's time to get out of London for a while! In the evenings the dress code is quite fancy so I felt the need to pop along to Topshop and buy a whole new outfit. I tried on 11 different things before I decided on a mustard skirt with a black cami. This necklace was on sale for £5.50 but is no longer on the website! Statement necklaces are a must with plain tops. So this is an outfit for one of the evenings I'm there but I've picked 2 dresses and a playsuit, with one as a back up for the other evenings I'm there. I bought this dress from New Look for a friend's birthday last year, and I've only worn it once! It's longer at the back and extremely comfortable to wear, especially paired with wedges. I'll probably wear the necklace with it and maybe put a belt on even though there is already a tie around it. Guess where this is from? Of course, it's Topshop. I bought this quite a few months ago but I haven't had a chance to wear it. Wearing it during dinner might be a risky move because of its colour but I will be extra careful as I love love love this playsuit!!!! This is my back-up depending on how I feel in the evening! Its floral design is really cute and it came with a black belt. It's from Boohoo and was really cheap. Boohoo do lovely dresses for such affordable prices so I'd definitely recommend! I don't expect to be in the pool a lot, hopefully I'll be exploring Devon a bit. But I shall fit some time in for relaxing in the meantime. The bikini on the right is from a shop in Brighton beach. My mum was there over the weekend and picked it up for me :). 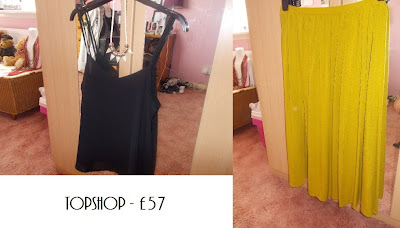 The one on the left is from New Look and is on sale - £6 for the top and £5 for the bottom. I wouldn't advise you to look for bikinis in their store, it's always such a mess so if you know your size then shopping on their website might be preferable. So the boring stuff - toiletries. Each of these were a pound - not from the pound shop but from Superdrug! They do really good holiday sized toiletries. I will be doing a life post on Wedneday or Friday next week about my trip. I hope you all have lovely weekends.